This winter has be a rough one for us so far. Our house is full of empty tissue boxes, and still-runny noses, empty soup cans (who has the energy to make anything from scratch? ), and piles of dirty dishes. Some days we all get so claustrophobic, such mind-numbing cabin fever, that we just need to get out. 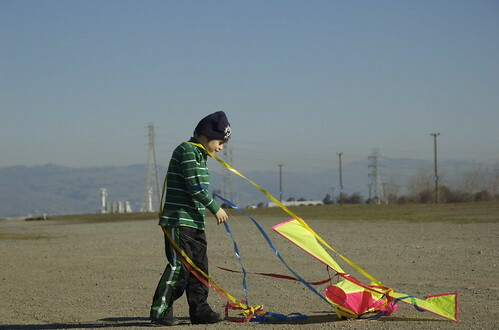 These are the days made especially for kite flying. Even when there’s no wind to hoist the kites aloft. I’m an avid kite flyer myself. I’ve got a collection of a dozen or so picked up at various shops amongst my travels. I have a giant cobra parasail that is kept in my car at all times so that if I’m ever enroute from one place to another and find a likely open space and a breeze I’ll be well prepared for a bit of flying. I even took a kite with me on my recent trip to Egypt and got to fly it some in the foot hills round Mt. Sinai. Hope your brood is healthy soon and finds a worthy wind to get those kites sailing properly. How incredibly inspiring — if I didn’t already have so much crap in the mini-van, I would totally add a kite to our must-carry-alongs!